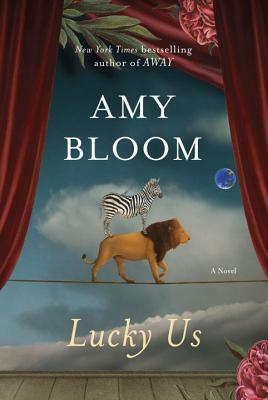 “Brilliantly written, deeply moving, fantastically funny, Lucky Us introduces us to Eva and Iris. Disappointed by their families, Iris, the hopeful star, and Eva, the sidekick, journey across 1940s America in search of fame and fortune. Iris’s ambitions take them from small-town Ohio to an unexpected and sensuous Hollywood, across the America of Reinvention in a stolen station wagon, to the jazz clubs and golden mansions of Long Island. Lucky Us (July 29) follows the journey of Eva and Iris, half sisters who make the best of their lives despite the challenges they face. It is broken into three parts over ten years from 1939-1949 (narrated by several of the characters) following their trek from Ohio to Hollywood to New York. They are both from broken homes, so-to-speak, Eva having been abandoned by her mother and Iris having lost hers to death. They piecemeal their family unit with quirky friends, lovers, an orphan son and an eccentric father which reiterates that family is much more than the ones you are related to. Eva didn’t finish school with all the moving around. Even when they were in one place for a length of time, she didn’t attend, not because she disliked knowledge (she was a sponge for information) but because answering questions about their strange life was too much. While Iris was the Hollywood star, the beautiful and theatrical daughter, Eva was the smart one. Her father quenched her thirst for knowledge and information by giving her Little Blue Books, which she used to educated herself. I couldn’t understand where this title came from. This cast of characters were far from lucky and they often made terrible, awful and selfish decisions that impacted innocents around them. If you got caught in their wake, watch out. But then I realized that they felt they were lucky, given all the second and third and fourth chances they received from life. It always turned around somehow. Aside from Eva, I didn’t like many of the characters. But over the years as a reader I have learned that liking characters is not what reading is about. Yes, maybe identifying with them is necessary to feel a connection to the story but many of the books I have loved have had terrible characters. I’m in it for the story. The journey. The escape from the everyday into a world I would never know about if not for books. One thing that resonates throughout this story is perseverance. Making the best out of terrible situations, even if you cause them. This little cast of characters always moved forward, always reinvented themselves to suit the task at hand. *Thank you to Edelweiss and Random House for the advance reader’s copy. I was not compensated nor required to post a review. Quotes may be changed in the final published copy. A little side note: I LOVED how each chapter title was a jazz song that highlighted their journey. Books and music are just one of my favorite pairings. Take a listen here. Tags: book club picks, coming of age, Dysfunctional Families, Historical Fiction, Literary Fiction, World War II. Bookmark the permalink.